This year’s conference is being hosted by Southampton Solent University, organised in partnership with ISVR, University of Southampton, and is held on Saturday 18th and Sunday 19th March 2017. We have an exciting programme of leading industry keynote speakers, workshops and technical demos from our sponsors. Technical Visit to Naim Audio, Salisbury. Naim Audio design & manufacture some of the finest high-end audio systems available in the world. This technical visit will give you an overview of the process of developing high end audio, and take you on a tour of their manufacturing facility. Demo of Dolby Atmos (6pm) & Film Screening (7pm). Southampton Solent University. 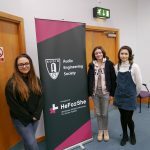 Southampton Solent University have one of the only private Dolby Atmos (3D audio) cinemas in the UK, and are one of only a handful of universities in the world to have an Atmos cinema system including mixing capability. The student film society run the cinema as a commercial operation, which means that they are able to show current release films. 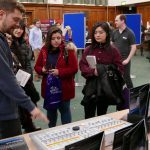 Student delegates to the conference will be given a demo and overview of the Dolby Atmos system, and are able to attend whichever film is showing on that evening for free (film yet to be confirmed). 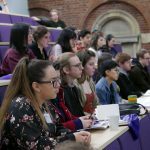 Welcome to the third edition of ‘Up your Output!’ – the AES British Section’s event specially designated for Student Members. 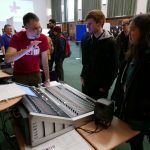 This event has one clear mission — to help students on their way to becoming successful working audio professionals. For a second consecutive year ‘UP!’ will be held as a two-day event, providing a great deal of lecture content and enough time for interaction with out sponsors. Additional tech-visit day to the Solid State Logic’s headquarters in Begbroke, Oxfordshire, is planned for Friday the 6th of March 2015. Additional shot tech visit to Dolby’s Soho office and demo theatre is scheduled for Monday morning the 9th. 1. 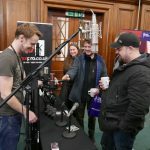 Tony Faulkner (Independent Recording Engineer, Green Room Productions): ‘Up your Input!’ – Discussion of microphone techniques, philosophies and psychologies in recording. 2. Jim Motley (Senior Vice President – International Sales, Solid State Logic): ‘Getting a job in the industry’. 3. Graham Boswell (Founding shareholder and Director, Prism Sound): ‘Evaluating the sound quality of audio interfaces’. 4. James Shannon (Senior Sound Consultant, Dolby Laboratories): ‘Film Sound: The Next Generation’. 5. Julian Storer (Founder, JUCE): ‘Noisy Coding’. 6. Dr Rob Toulson (Director, The Cultures of The Digital Economy Research Institute):‘iPhone app development for sound engineers’. 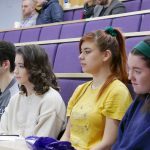 Welcome to the second edition of ‘Up your Output!’ – the AES British Section’s event specially designated for Student Members. This year we have decided to upgrade ‘Up!’ to a two-day event, providing an even greater lecture content and more time for interaction with out sponsors. John Richards (CEO, Oxford Digital): ‘Optimizing Compact Loudspeaker Performance – the role of DSP’. John Watkinson (Founder and Director, Run Length Limited): ‘Dealing with Irrationality’.John has also kindly agreed to demo his omnidirectional state-of-the-art loudspeakers. David Pope (CEO, MusicScreen Ltd): ‘Live By Satellite To Cinema’. Carlos Lellis Ferreira (Academic Programme Leader, Audio Production, SAE Institute UK):‘Using Mixing Tools Musically’. Andy Farnell (Author and pioneer in the field of procedural audio): ‘A Portrait of the Engineer’. Welcome to the first AES event in the UK specially designated for Student Members. 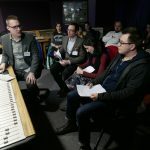 Our hope is that this event will become a recurring practice with one clear mission — to help students on their way to becoming successful working audio professionals. The 9th of March 2013, Saturday at SAE Institute, London, 297 Kingsland Rd, E8 4DD, SAE House building. Francis Rumsey (Chair, AES Technical Council): ‘Spatial Audio – How it works’. Peter Eastty (CTO, Oxford Digital): ‘Digital Filters for the Lightly Bewildered’. Graham Boswell (Founding shareholder and director, Prism Sound): ‘An introduction to high-quality audio technical challenges, measurement and perception’ (with additional material courtesy of Hugh Robjohns, Technical Editor, Sound on Sound magazine). Stephen O’Callaghan (Audio Manager, Sony Computer Entertainment London Studio): ‘Audio for Games – This is how we do it’. John Watkinson (Founder and Director, Run Length Limited): ‘Developments in Loudspeaker Technology’. Each lecture is planned to be one hour long with enough time for Q&A. A PDF version of the Official Programme can be downloaded here.